I hope this installment is full of several short tips. Here goes. [Lifehacker post where I discovered the proper name.] Basically, this is a French term for “bucket in which you deposit all your pocket stuff when you get home.” I’ve only recently starting doing this, and it’s made an immediate difference. My desk is way cleaner than it was previously, since I don’t have all my crap scattered across it. More importantly, I can feel pretty confident that I have everything I need when I leave in the morning, no matter how tired I am. I can’t tell you how many times I’ve forgotten to bring a pen, my pager, my stethoscope, etc. (When I’m tired and in a hurry it’s amazing I remember anything at all.) 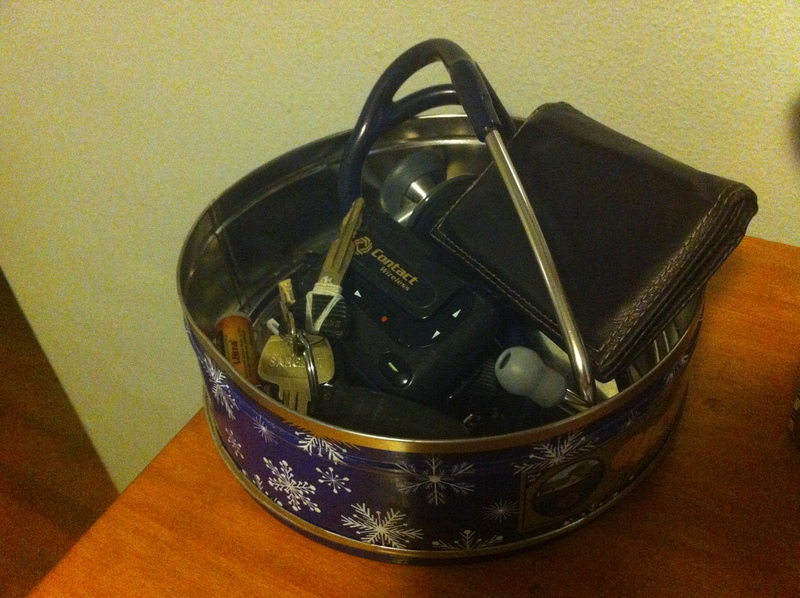 Now, when I get home, the first thing I do is tear my to-dos out of my mini comp book and set it on my computer, but the next thing is to take everything out of my pockets, take off my pager and stethoscope, and put it all in my cookie-tin-turned-Vide-Poche. The next day I know exactly where I’ve put it all, and I’ll remember it all as long as I remember any of it. Whether or not you use this tip, I suggest you make some morning and afternoon lists, at least until you get the hang of things. Here’s what I mean. My first third year rotation was surgery. Some days, the early mornings were… early. As I alluded in the previous post, it seemed like I would forget something almost every day. Since I was across town at the VA, it’s not like I could just make a quick trip back home. I’ve been a fan of using checklists for a while (always meant to read The Checklist Manifesto — maybe I’ll get a chance now that 3rd year is coming to an end :) ). Basically, some stuff is boring, repetitive, but important, and it doesn’t make sense to try to remember it. Pilots and surgeons use checklists all the time (“timeouts”), so I figure why not. I made a quick checklist I called my “Morning #List” and my “Afternoon #List”. I use hashtags so I can search for stuff without getting extraneous results that happen to involve the same words. I’d glance at my afternoon list before heading home from the VA, and it would remind me to get new scrubs, grab a list of cases for the next morning, double check that all my notes were submitted, etc. That kind of stuff. Saved me a lot of headaches in the long run, very little effort to make and use. To ensure I always had them with me, I used Simplenote. Simplenote is a sweet, sweet, ultra-simple tool. It takes plain-text notes and syncs them. It has a web interface and native iOS apps. It supports note tagging and full-content searching. It syncs with a ton of third-party apps. It has awesome note sharing that my SO and I use to keep track of places we want to eat and movies we’d like to see, and my roomie and I keep a shared list of all our movies (so we never rent something the other one already has). But the most important part is that it syncs, and it syncs fast. Because it’s “plain-text” (meaning no fancy pictures or anything), there’s not a lot of information to sync. Even really long notes sync fast. So I use an app called Notational Velocity on my Mac, which syncs with Simplenote on my iPhone and iPad, and all my notes stay in sync, fast. There are simple ways to set it up with Android and PC as well. Because the full-content search lets me find stuff in a hurry, I use it for everything, I have around 160 notes now. But I can type in “food,” and it instantly filters out any note that doesn’t have the word “food.” I can type in “#food” to only show notes that I’ve decided are food-relevant enough to deserve a hashtag. It’s great. It’s just handy, and it works. Give it a shot. Worst case scenario: it’s free. Extra bonus: as of the last time I checked, the web interface was accessible from both the hospital and the VA computers. Make sure you log out when you’re done. Two very generous students, senior to me, have shared a bunch of their rotation tips with my class. I found these useful to look over before and during each block. Now I’m sharing them with you. These files will be hosted at SMRTpoint or perhaps UNMSOM Sharepoint eventually, so they will be password-secured and accessible only by UNMSOM students. For now, just shoot me an email from your Salud address with the subject (without the quotes): “Stuff from BA and JO”. You’ll only get a reply if the email is from your Salud address, to make sure this stays UNMSOM material. I’ll post updates here when I get it uploaded somewhere secure. Unfortunately, as a MS3 you’ll always be looking for a good place to keep your stuff. Most rotations, you just don’t have a convenient, secure place to leave your bag while you pre-round, round, go to lunch, etc. On some rotations, your assigned lockers will be close enough from “home base.” Other times, they’ll be a few floors away, or across town if you’re at the VA. I found it worthwhile to carry one of these around and just leave it in my backpack at all times. The VA has empty cabinets all over the place that work great with this type of lock. If you’ll be carrying anything valuable in your bag, it will be worth it. Alright folks, that’s all for today.